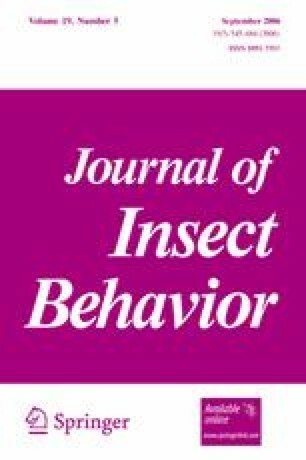 Specific mate recognition systems should enable species to recognize conspecific mates correctly. However, heterospecific matings have been observed in a variety of taxa. One of these cases is the pygmy grasshopper genus Tetrix, in which three species show sexual interactions. T. ceperoi males mount preferably females of T. subulata, but they are rejected as mates. T. subulata males prefer T. undulata females over conspecific females and heterospecific matings occur. Here, we study the underlying behavioural mechanisms of this pattern by analysing the visual courtship behaviour of the three species videographically. We test the hypothesis that the displays of T. ceperoi are highly differentiated from the other species, while the courtship of T. subulata and T. undulata is more similar. This is supported by our results: while T. ceperoi males perform a fast movement of high amplitude (“pronotal bobbing”), the other two species show only minor movements (“lateral swinging,” “frontal swinging”). The first function of a discriminant analysis of the temporal dimensions of the displays explained 96% of the variance. 100% of the T. ceperoi displays were classified correctly, whereas only 50% of the T. subulata and 81% of the T. undulata displays were grouped accurately. A two-way ANOVA revealed no significant effects of the direction of the “swinging” movements (laterally or frontally) and no interactions between direction and species either, whereas each temporal parameter differed significantly between the three species. The highest degree of differentiation was found between T. ceperoi and T. undulata, while T. subulata and T. undulata only differed significantly in two of the six temporal parameters. Our results suggest that the mismatings between T. undulata and T. subulata are caused by an insufficient specificity of the courtship behaviour. Apparently, ecological segregation of these two species could impede sexual interactions in the field. We wish to thank T. Eggers, A. Kratochwil and two anonymous referees for helpful comments on the manuscript. The district government Weser-Ems (national park administration) kindly permitted the access to the study sites. Research facilities and financial support were provided by the Division of Ecology at the University of Osnabrück. J. G. was supported by the GradFöG (Graduiertenförderung des Landes Niedersachsen), a post graduate studentship.